May 2, 2015 was Independent Bookstore Day. I took this opportunity to visit the black-owned Ancestry Books in North Minneapolis. Ancestry Books is a new bookstore, started by writer/teacher/activist Chaun Webster and his wife, Verna Wong, a writer and teacher in the public school district. They had long had a dream of opening a literary space with a focus on indigenous authors and authors of color that would engage the immediate community. Ancestry Books had been open for a year, launched with a Kickstarter and the volunteer labor of the community to build out the store. I had been meaning to go up there but hadn’t made the time. Chaun describes the store as a third-space, and indeed it is. 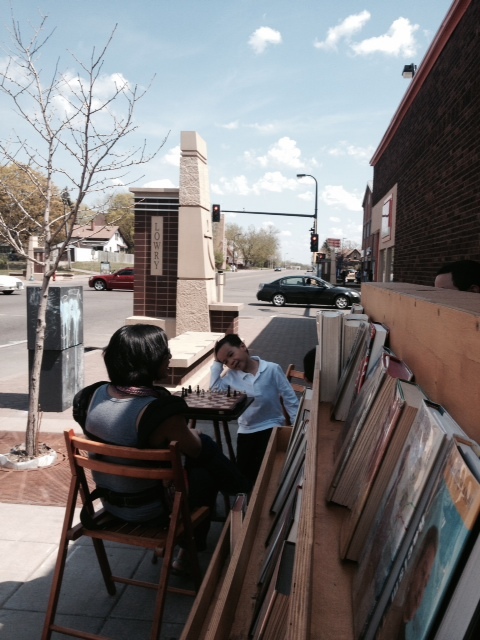 It is a small, highly curated shop that welcomes you from the street with a mobile library of books and a chess game out front. The books they carry are intentionally challenge the notion of master narratives and emphasize voices that have been underrepresented in the canons and contemporary conversations of literature. I’d heard from several friends that they have an incredible selection of children’s books that again, are representative of a wide range of race, politics, and gender narratives that are often absent in mainstream stores. Affirming this was a family shopping with their children and talking about how great it was to have a bookstore in the community and buying books for both themselves and their children. I purchased a copy of Claudia Rankine’s Citizen: An American Lyric (also published by Graywolf, a Minneapolis press) and several ‘zines that Chaun had written. I am a big advocate of supporting local artists, writers, and musicians by buying their work. I spent some time talking with Chaun about the shop, his own writing, and the influence of Lewis Micheaux, founder and owner of the Nation Memorial African Bookstore in Harlem, on Chaun’s own vision.